Re-engage customers that walk away with personal and automated campaigns. Compatible with Facebook Pixel, Google Ads and Adwords. Everything you need to re-engage your customers. Send any type of campaign to customers after they visited your venue. Engage customers with automated and one-off emails. Retarget customers with online advertising based on their physical actions. Schedule time when your retargeting campaign should be delivered. Segment your customers based on their age, gender and interests. Schedule time when your campaigns should be delivered. See views and measure if people take specific action in your venue. Check out all benefits that come with a complete Bleesk platform. It all comes together with Retargeting as well. Connect Bleesk with external services and products your business uses on a daily basis. The shopping journey doesn’t always end with a store visit, so why should your marketing efforts? Bleesk's Retargeting allows retail marketers to take advantage of in-store location signals to personalize post store visit marketing efforts. 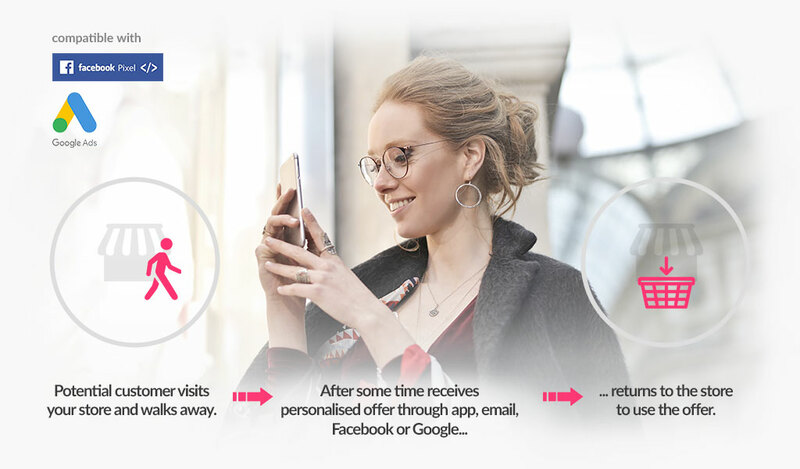 Whether you want to stimulate return visits to the store or increase loyalty through online engagement, Bleesk makes it easy to tailor your online messages based on in-store behaviors. You can retarget rich-media campaigns through In-app Notification, E-mail sent to your customer's inbox, Facebook Pixel or Google Ads. As a provider of marketing solutions, our relationship with Bleesk has allowed us to provide a cost-effective, high engagement, marketing tool for our clients that give an edge over their competition. Our clients have increased their customer acquisition, engagement, customer loyalty, and retention.